Whenever you record a cash sale or a customer payment on an invoice, QuickBooks 2016 adds the cash to its list of undeposited funds. These undeposited funds could be a bunch of checks that you haven’t yet deposited, or they could consist of coinage (currency and coins) or even credit card payments, if you accept those. 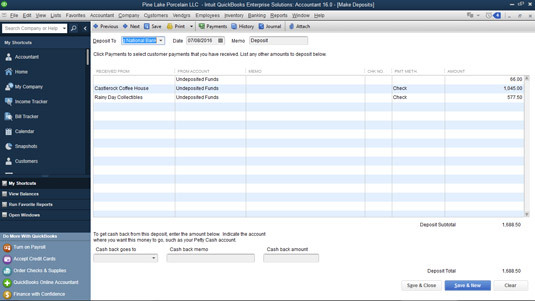 You can also tell QuickBooks to give you the choice of indicating that a particular payment or sales receipt is deposited directly into a specified account. To tell QuickBooks to give you this choice, choose Edit → Preferences, scroll down to the Payments icon, click the Company Preferences tab, and then deselect the Use Undeposited Funds as a Default Deposit to Account option. After you make this change, QuickBooks adds buttons and a box to the lower-left corner of the Enter Sales Receipts and Receive Payments windows so that you can indicate into which bank account the money is deposited. Choose Banking → Make Deposits. The Payments to Deposit dialog box. Select the payments that you want to deposit. Click a payment or cash receipt to place a check mark in front of it, marking it for deposit. If you want to deselect a payment, click it again. To deselect all the payments, click the Select None button. To select all the payments, click the Select All button. If you have gobs of payments to look through, you can also filter the list by clicking View Payment Method Type at the top and see only the Cash or Credit Cards to select among. If you’re recording credit card payments deposited, you don’t also need to sort through the check payments. They aren’t gone; they just don’t appear until you select that type of payment or All. 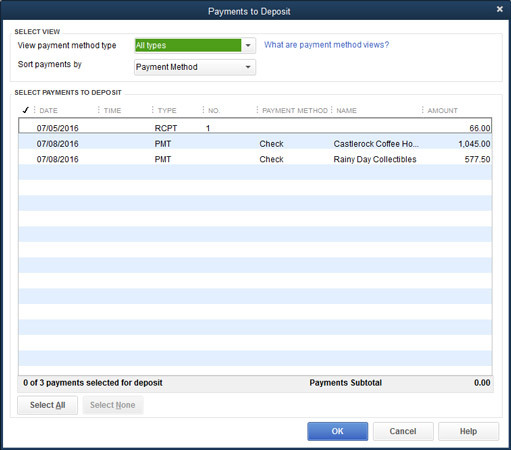 After you indicate which payments you want to deposit, click OK. QuickBooks displays the Make Deposits window. If you need to redisplay the Payments to Deposit dialog box — maybe you made a mistake or something, and now you need to go back and fix it — click the Payments button at the top of the Make Deposits screen. Note, though, that QuickBooks won’t display the Payments to Deposit dialog box unless the undeposited funds list still has un-deposited payments in it. Tell QuickBooks into which bank account you want to deposit the money. Activate the Deposit To drop-down list and choose the bank account in which you want to place the funds. (Optional) Add a memo description if you want to. If you want cash back from the deposit, activate the Cash Back Goes To drop-down list and choose a cash account, such as Petty Cash. Then enter a memo in the Cash Back Memo text box and the amount of cash back you’re taking in the Cash Back Amount text box. Record the deposit by clicking the Save & Close button or the Save & New button. If you click Save & New, QuickBooks displays a new blank Make Deposits window. If you sometimes take cash from the register or from the day’s collections to spend on business supplies, for COD (collect on delivery) payments, and even for owner draws, you enter the cash payment transaction as another transaction line in the Make Deposits window. For example, if you use $50 from the cash register to pay for office supplies from Acme Office Store, you enter another line into the Make Deposits window. You enter Acme Office Store into the Received From column, your office supplies expense account into the From Account column, and –50 into the Amount column. You use a negative amount to reduce the total deposit to the correct amount that is actually deposited into the checking account and to charge the expense account for the amount paid out. This is also where you record the Merchant Fees deducted from your credit card deposits.